(NaturalNews) Passionate about health and the great outdoors, Coloradans are insistent on producing more food locally, a move that would greatly reduce carbon footprints, provide more transparency and supply communities with fresh produce year-round. While commercial food production continues to be exposed as unhealthy and unsustainable, more communities are turning to locally produced food, strengthening the local economy by adding jobs and building trusting relationships among citizens. Colorado seems to be spearheading this initiative with the approval of the Colorado Cottage Foods Act, which passed in 2012 and allows small-scale producers to sell certain foods ("potentially non-hazardous foods") without a license directly from their homes, roadside stands, websites, events and farmers markets. Suppliers must pay a one-time fee of $20 before selling their items anytime between the hours of 8:00 AM and dusk. 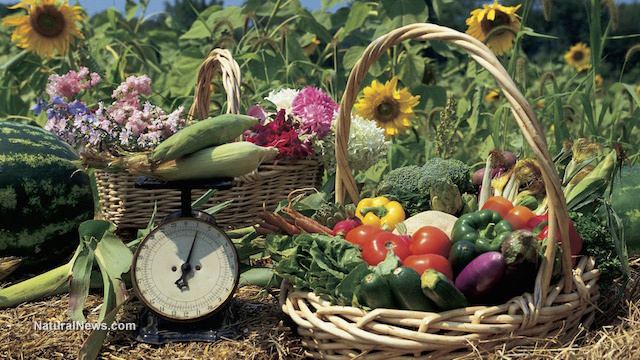 In addition to their own backyard garden, sellers may also grow the food at any community garden or urban farm. Upon completion of a basic food safety course, anyone can start selling a limited range of foods including spices, teas, dehydrated produce, nuts, seeds, honey, jams, jellies, preserves, fruit butter and baked goods, including candies. Under the provision, suppliers must only sell directly to consumers and not to third-party retailers such as grocery stores or restaurants, according to Colorado Farm to Market, a website dedicated to providing up-to-date information on food processing in the state. Sellers are also required to label packaged foods with their name, address and ingredient lists, as well as the date of packaging for items such as eggs. While sellers may not exceed $5,000 a year in net sales per product, there is no cap on overall sales, meaning growers can sell as much as they want as long as each product does not exceed the set limit. Foods that require refrigeration, such as salsa, condiments and some baked goods, including those containing cream, cheese, custard or meringue, are excluded from the act and must be prepared in commercial kitchens and sold through the state's standard licensing process for food retailers. Denver's local food movement has many Coloradans excited as they prepare to begin selling homegrown produce in front-yard stands, connecting with neighbors and other members of the community. The program is intended to "expand access to affordable foods and help increase neighbor-to-neighbor interactions, as well as give people additional income opportunities," reports the Denver Business Journal. "It's also meant to help improve sustainability by reducing the transportation time and distance food travels to reach a person's table." One of the first to take advantage of the city's new urban farming program, Deb Neeley will begin selling her backyard produce from a stand set up in the front of her home three times a week. "Our goal is to provide the most vibrant and healthful organic produce, eggs and wellness products from a residential farm and branch locations in NW Denver"
Called Green Gate Urban Farm & Gardens, her stand will offer a variety of items including apples, pears, currant, elderberry, leafy green kale and collards, radishes, beets and many more. "This is about as fresh as it gets," said Neeley, who told The Denver Post that her green grape vines produced about 100 pounds of fruit last year. "Everybody should have access to nutritious, organic food, and it should be affordable," she said. "A lot of what I'm trying to do is set an example here to inspire people to grow their own food as well — I don't want to be the only one doing this."